Recycle rubbish into wicked works of art while doing your bit to clean up the world at the same time! Sign up to Sustainable Coastlines for more coastal loving! Crew At least 1 but the more the merrier (and cleaner)! Safety Be careful about where you decide to rummage (especially around water): people biff all sorts of sharp and smelly things! Tools Gloves, rubbish sack, tarpaulin/newspaper. Glue, paper, scissors, tape, string etc to transform your trash to art. Make art and fashion out of recycled rubbish. Check out the notes for the tool list you need (above) and sculpt that trash! Get primed to be a Picasso of plastic by watching this awesome time-lapse of a clean-up on Rangitoto Island in Auckland, and the sweet-as dolphin art work that resulted from the 8,327 bottle caps collected on the beach. Ka pai Sustainable Coastlines! With your squad of soon-to-be junk artists, scout out a wild place that needs some lovin’ (i.e., a decent clean up): check out your local beach, stream or riverside. Or you could get the muck out of the mangroves, like at Mangaere (pictured) in South Auckland. Get gloved up and use your wild eyes to spot rubbish that doesn’t belong there, especially stuff that is bad for the environment or wildlife, like plastic bags and bottles. Collect it all in your rubbish sack. Make a checklist of litter to find or turn the trash busting into a treasure hunt. Make it into a competition to see who can find the wackiest and weirdest stuff that's been thrown away. Isn't it nuts to think about where the Bunnings balloon or KFC straw ends up when you let it go? Check the 'What's Happening' tab to get in the know! Spread out your treasures on a tarpaulin or newspaper and harness your creative powers to see what they could become. You could arrange them into colours, textures or shapes. Get ready to paint with plastic! Then, using the glue, paper, scissors and sellotape, love-up that litter and transform it into an up-cycled artwork! You could make a mosaic of one of the weird and wonderful sea creatures that you're helping out by cleaning up (e.g. a dolphin, penguin, octopus or koura), OR you could make a sculpture (check out the next level swag in the 'inspiration' tab). Upload your awesome junk art work to the Wild Eyes art critics, and earn points to get your eyes to the next level. How about putting on a wild waste art exhibition with your friends or classmates? Maybe you could have an auction to raise funds for a cause – like a local reserve or clean-up effort! 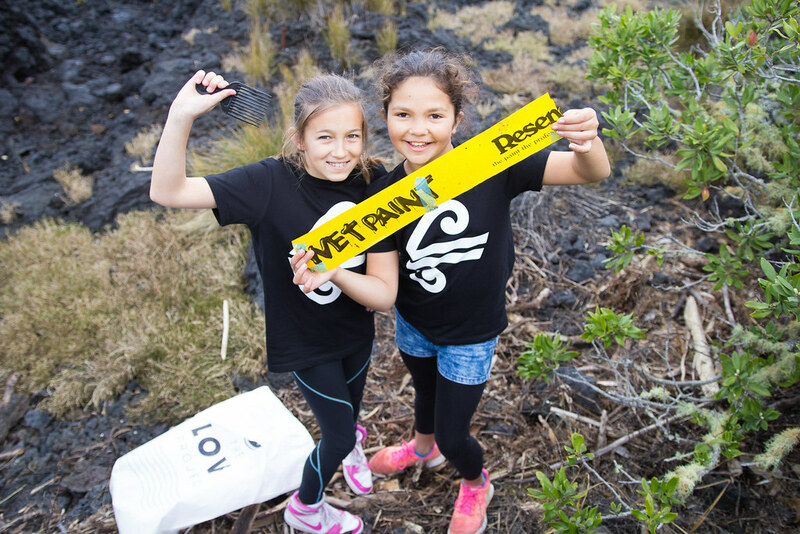 For extra wildness, talk with your teacher, parents or Love Your Coast group and identify a neglected neighbourhood nature spot that needs a visit from the trash busters. Set a date and organize a trash busting team. Get local media and dignitaries along to see the results of your trash exorcism. TIP: take BEFORE and AFTER photos so it's clear what impact you've had! And for double bonus wildness take your junk art to the next level: get inspired by Australian designer Marina DeBris and turn your junk into fashionable beach couture! For more wearable art inspiration check out Wellington's WOW! In the 21st Century we humans make a huge amount of stuff. (Scientists reckon that’s a big part of how we’re changing the Earth’s climate.) So much of this stuff gets chucked out – in fact, in little old New Zealand we managed to throw away more than 25 tonnes of plastic waste every day! – Going down the drain. Where does the water from your sink and gutter go? As Nemo says, most storm water drains in New Zealand Cities go straight out into the rivers and streams and then the ocean. This picture is off all the junk that the Sustainable Coastlines found in a single drain on Auckland's Queen St. I've got a very sore tummy! That glitter that was cool on the Christmas card for your Mum is not so cool in the tummy of a turtle … so next time you rinse stuff down the sink, like paint or your sister's cooking, have a think about where it goes. These toxic and long-lasting plastics go straight into the sea where they end up in the stomachs of marine animals, like this poor albatross. – You wouldn't eat this, so don't feed it to me! The Great Pacific Garbage Patch is roughly 13 times the size of New Zealand, and isn’t really that great at all! It’s a swirling mass of plastic bags and bottles; a thick soup of plastic gloop in the north east of the Pacific Ocean. It’s the world’s biggest landfill, always pulling in more junk, like the Death Star’s tractor beam. Single-use, disposable plastic makes up nearly ¾ of all rubbish picked up on New Zealand beaches. Making it into art is not only a way of getting another use out of it, but also a way of getting us to think about the things we use and how they affect the world around us. Be a superhero who saves the planet and get your Mum to shop with a reusable cloth bag or cardboard box! – Used? Once. Kills things? Forever. YOUR WORLD IS A PIG STY! Imagine if instead of going to the tip all your house’s rubbish just got piled up in your room. That’s a bit like what’s happening to Planet Earth on a bigger scale. Unless we start using less and recycling more all this everlasting stuff is causing a lot of problems. Being a junk artist is a start! – Would you live here? Washed Ashore is a US project raising awareness about plastic pollution in oceans and waterways by making EPIC animal sculptures from ocean waste collected in beach clean-ups. Check out the mega junk art gallery here: for BFG-sized fish, octopus, seals and jellyfish. These guys are junk artist maestros! Can your creation match theirs?! Yuss! Here's a behind-the-scenes look at how Washed Ashore made a magnificent marlin from plastic and other trash found in a beach-clean up. Can you sculpt a giant sized NZ animal? You win Wild Eyes if you can!! I recycle a heap of stuff (twigs, leaves ...) to make my nest, but I've never used jandals like these washed up flip-flop artists! Check this Junk Art Top 40 for more sweet-as-manuka-honey examples of awesome art made from common trash. – Planet earth says ka pai! If you get a local beach or stream clean-up happening you can feel great about helping the planet, and if you've lucky you could get a present for your Mum for forgetting her birthday, like this hair comb (maybe wash it first)! Is it art or is it science? Either way, we reckon this is the supreme award-winner for something made from waste. Be gob-smacked by Dutch designer Theo Jansen's amazing wind-powered beach 'animals' made from recycled PVC pipes and plastic sheets. Maybe if your beach clean-up is massive enough you'll be able to make it a friendly habitat for these sublime sand creatures? If you want to truly take it the next level, check out what two brothers from Haiti – Adlin (13) and Wens (15) – made from trash they found ... could you make a remote controlled truck from scratch? I arranged the bits of rubbish into groups by their color. he is 100% recycled! his head is an egg carton and his body is a cracker box. With this we ( lauren and I) thought we'd help the school by picking up the junk we found from around the school and painted it. today we did the junk artist it was really fun it did take some time but that was ok are group was shay, bridget, nikita and mia it was really cool!!! I'm a bottle nosed dolphin, but I'm made from milk bottle tops! With less plastic waste in our ocean there'd be more of me = take a tote bag to the shops instead of a plastic bag Mum!